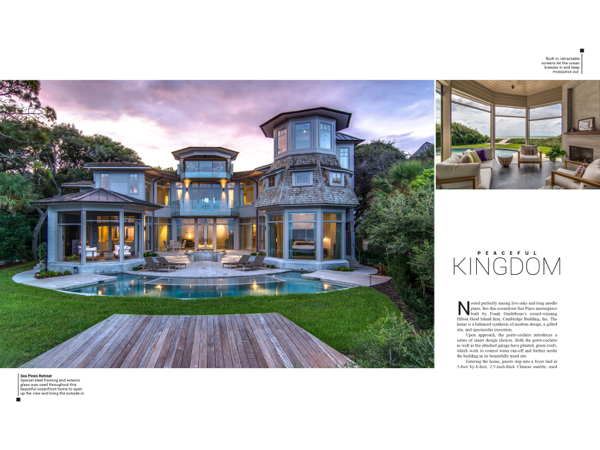 Special steel framing and exterior glass was used throughout this beautiful oceanfront home to open up the view and bring the outside in. Upon approach, the porte-cochère introduces a series of smart design choices. Both the porte-cochère as well as the attached garage have planted, green roofs, which work to control water run-off and further nestle the building in its beautifully treed site. This stunning backsplash is made of stone slab and is the perfect accent to a bright, modern kitchen with clean lines. Gorgeous vistas of the Atlantic Ocean and a walkway to the beach from the second floor. Polished concrete was used as flooring on the first level, adding to the industrial feel of this unique home. Entering the home, guests step into a foyer laid in 5-foot by-8-foot, 2.5-inch-thick Chinese marble, used throughout the home. Upper and lower exterior decks, porches, interior halls and stairways all are tastefully clad in this luxurious natural stone. Virtually every room in this home celebrates the oceanfront lot on which it was built. 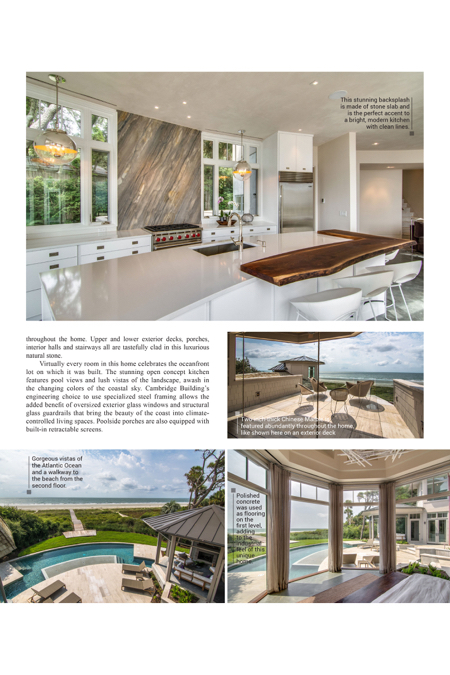 The stunning open concept kitchen features pool views and lush vistas of the landscape, awash in the changing colors of the coastal sky. Cambridge Building’s engineering choice to use specialized steel framing allows the added benefit of oversized exterior glass windows and structural glass guardrails that bring the beauty of the coast into climate-controlled living spaces. Poolside porches are also equipped with built-in retractable screens.